Two snippets, from two quite different sources, raise concerns about self-serving (as opposed to principled) thinking about race in South Africa and at the University of Cape Town, where I teach. First, we have Douglas Gibson expressing concern that “race is back in fashion” in South African conversation. Gibson is the former Chief Whip of the Democratic Party, which became the Democratic Alliance (DA), South Africa’s official opposition. I’ve only had a couple of conversations with Gibson, but have read many of his speeches and columns over the years, and regard him as a determinedly old-school liberal, rather than someone who is happy to let pragmatism dominate, as seems to be the case for many in today’s DA. Thirty five years ago a little white boy aged three, standing in his bathing costume next to the pool, stroked the arm of a little black girl, also in a bathing costume, and said, “Ooh, you’ve got a lovely tan.” My son didn’t see race and certainly had no race prejudice. That was at the height of apartheid. He is still not a racist, just as many other whites are not. There are two distinct points to make about examples like this. The first is that we can agree (or not) that this is an ideal future to try and arrive in. The second is that we can agree (or not) on how to get there. A concern that I and others have about DA rhetoric is that it seems to want to get there by insisting on it, and by asking us all to just ignore race, because in doing so we’ll discover all sorts of other relevant and interesting things about each other as individuals. As ever, I think some things are easier to say and support from one point of view rather than another. I don’t experience what it’s like to be black in South Africa, but if what I’ve heard is accurate – and I’ve heard it from black intellectuals far more qualified and socio-economically advantaged than me – they perceive racism far more often than they should (the “should” here would of course be zero times). I’ve said in the past that the perception of Cape Town as being racist can’t simply be dismissed, and still think that even if we agree on an (eventual) goal of non-racism, we might find (a) that we can never get there or (b) that the way to get there is precisely to acknowledge race and prejudice, rather than pretend people don’t have these experiences. To put it crudely – columns like Gibson’s, romantically espousing non-racialism, can be read as part of the problem in their denial of the validity of the lived experience of people who feel discriminated against. It can appear like you’re being told to simply “get over it”, and I think that’s condescending. The other example I want to highlight is from Dr Xolela Mangcu, who is at the furthest remove possible from Gibson in at least two respects, in that he is a black Biko scholar, rather than a white liberal. 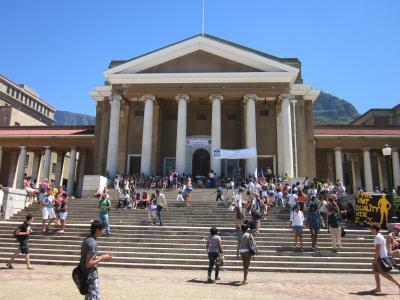 Mangu has been columning voluminously about UCT’s new admissions policy for the past few months, and some of these columns have attracted responses from our Vice-Chancellor, Dr Max Price. Numbers matter also because there should be a critical mass of black professors in the University Senate, which is the highest decision-making body when it comes to academic affairs. I just find it difficult to imagine that doing away with race-based affirmative action would have been such a high priority for the Senate, or would have passed so easily, if that august body was populated by a large number of black full professors. And here’s my problem: even if you think the admissions policy flawed, Mangcu’s words there seem to me to insult the black professoriate, or otherwise to indicate a laziness of thought on this issue, or are otherwise simply mendacious. To briefly run through the options: the extract could insult black members of Senate, in that it suggests that they cannot be of independent mind regardless of perceived race-interest, and think that a policy might be the correct policy on principle even if it attracts the sorts of controversy it has. Second, it could indicate a laziness of thought, in that he’s simply assuming that everyone who is a black Senator is somehow going to ineluctably reach the same conclusions about the policy as he did – in other words, that his is the only reasonable interpretation. The arrogance of this would be one problem, and the second would be that it would make his argument circular, in that he’d be saying “the policy is wrong, and if Senate were black in the majority, they would vote against it, which proves that the policy is wrong”. Finally, it could well be that Mangcu doesn’t think his analysis is the only defensible one, and it could be that he simultaneously knows that some black Professors support it. If these conditions were both met (and if I haven’t left out other options) then it seems that he’s misrepresenting the case for rhetorical effect – just like Gibson is. My point, in short, is that given that we recognise how fraught these conversations are, we should be careful to have them honestly, contextually, and objectively, in the sense that the quality of arguments can still matter, even if you think there’s something distinct about how race informs an argument.